Want to receive alerts about Dress Up Days....Get Reminders about Contests....hear the latest on Block H opportunities? 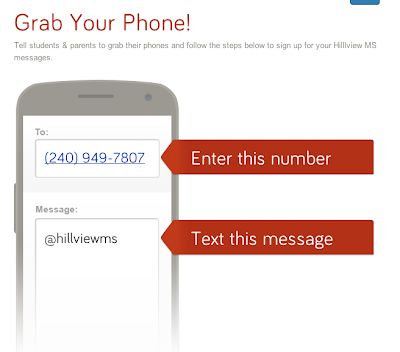 Parents and students can opt-in to receive ASB text messages through Hillview's ASB Remind101! Follow the directions above! It's free (standard text message rates apply)....and we promise not to spam or bombard you with texts! It's an easy way to stay up-to-date while keeping your phone number (and ours) private. Note: This is a one-way text message reminder service. You will not be able to send messages! We updated the information on how to unsubscribe. But why would anyone want to!! :) Thanks for the tip. This is great. We will certainly sign up!